This report is over a year old and there are no longer any plans to begin filming in 2018. Netflix is now developing Narnia adaptations, and how that will affect The Silver Chair has not been officially addressed. 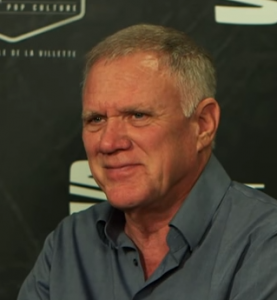 The Chronicles of Narnia: The Silver Chair director Joe Johnston was in attendance at a comic convention in Paris last week. He was interviewed about his career in film and answered some questions about Narnia. In this interview, Johnston says that they are currently “rewriting the script” and will hopefully shoot in New Zealand next winter. Q: Could you tell me a little bit about Narnia: The Silver Chair? JJ: It’s the fourth film in the series. It’s a totally new, different studio. It’s Sony and Mark Gordon Company. We are planning to shoot it in New Zealand next winter, so we’d probably start prep maybe in July and then shoot in the South Island of New Zealand. It’s a little bit darker than the other Narnia films. I think The Silver Chair was the darkest of the books. It’s classic literature, really. I think the work of C.S. Lewis is amazing — even though they were written for children, it’s classic literature, and I just thought that this would be fun. I love New Zealand, too. Q: Is it going to be visually different because it’s a new studio or are you going to try to keep the look of the previous films? JJ: No, I don’t want it to look like the other films. I want an audience to look at The Silver Chair and think, “This is a whole new vision of The Chronicles of Narnia.” In fact, I don’t even want to reference the other films. It’s like it’s starting a whole new thing. Thanks to narnia fan 7 for the alert. Here is everything we know about The Chronicles of Narnia: The Silver Chair. Nice to get an update from Johnston. So it’s principal photography in late 2018/early 2019, then a minimum of 8 months of post-production/pick-up shooting, marketing, etc, is it reasonable to maybe think the film could be released in December 2019? Maybe. But I’m guessing it would be in the spring of 2020. I am encouraged that he wants to make the look and feel of this film different from the others. The visual design of the Walden series got the job done, but I don’t think it was strong enough that Johnston should feel the need to preserve any of it. I think he’s making the right creative choice. I wish people would stop referring to the first 3 Narnia films like they’re outdated, and that The Silver Chair will have NOTHING to do with it. This is half-true, half-false. Personally, I think this is going to be like James Bond. The audience that helped the Daniel Craig installments make money probably saw the Pierce Brosnan ones beforehand… at least most did. The Silver Chair’s target audience WILL be heavily comprised of people who already own the first 3 movies, and want to see "what happens next" in Lewis’ story. Let me put it this way: If The Magician’s Nephew ever gets made, it will simply be the "Casino Royale" of the Narnia series. I Hope they will have all and full old-cast one more time only in The Silver Chair and after when that’s over then bring out all-new-cast in The Horse and His Boy , The Magician’s Nephew , The Last Battle. This new production is absolutely clear that they have to do everything new, not only because they may have different ideas about Narnia, but also because of copyright issues with Walden. like in the books Saruman , You , Radagast , Alatar , Pallando. you are way ahead of: Caspian , Rilian , Tirian , Drinian , Erlian. Firstly, Will Poulter has pass the certain age for playing Eustace as in the book. Secondly, Caspian portrait in the 2 film utterly missed the Caspian as in the book, who adore the Kings and Queens of old – I tell you I have to imagine a new Caspian younger and if not better which I believe is offered by the book. Thirdly, Liam Neeson voice may be necessary, but not spot on. I want what Lewis described it – deep and golden. Liam is simply soft, flat and smooth, and it missed a great sharpness to it. Fourthly, the influence of the first three films: With the first, it inspired me; with the second, it dissatisfied me; with the third, it disappointed me. I wish the SC to be a book-centered film and to be a recreation image and not regenerating one. I Want the film to shot in April 1, 2018 then June 2018 big movie premiere then released on July 15, 2018. Noah Huntley – the adult Peter Pevensie. Sophie Winkleman – the adult Susan Pevensie. Skander Keynes – Edmund Pevensie. Will Poulter – Eustace Scrubb. Andi Horton – Jill Pole. Billy Connolly – The Giant King. Maggie Smith – The Giant Queen. Miranda Otto – Lady in the Green Kirtle. It Really has been six years since 2011 , 2012 , 2013 , 2014 , 2015 , 2016. so now let the countdown begin i say you know. Well The Listline of cast witch isin’t mine because i never created this was actully on wikipedia April-May 2017 it hatoo be thrown because of the Will Poulter isheu but don’t worry i told and i written for Joe Johnston i said to him go to the Church and pray and light a candle of Will Poulter as a 19 year old man again for The Silver Chair but Lucy might be in this movie but that’s not up to me it’s for Johnston to decide but at least you guy’s are happy that Peter , Susan , Edmund are in the casting of the film. The Real Trailer might come out in June 2018. Would this be a new Task. What do you Think. Good,Bad or Ugly. And i hope for Peter Jackson directing The Horse and His Boy , The Magician’s Nephew , The Last Battle. is a video for The Silver Chair. How do you feel about how the Christian elements were handled in the movies with which he was involved? If you are referring to VDT the Christian elements were treated in a clumsy fashion, really. I went to Prince Caspian with a church group, and they weren’t too impressed with how the Christian themes in that book were treated either. They should not strongly force those christian theme into the movie like most christian movies do, which is why they are so bad and ineffective on sight: they tend to stress on the emotional level and seriously fake reality. The truth is, it should not be label as ‘christian themes’; HOPE, TRUTH, SIGN, ANIMALS, EVIL are share by all human being of all place. Being true to express the face of all themes either good and evil is the best of option. The Silver Chair should be presented as nothing less or more as it is, The Silver Chair, and could be more satisfy when Joe thought of staying true to the essence. Mr Gresham is very much involved. He is a producer, and has a bigger say on the script than ever. This is great. To have SOME real news from the director. At last! Something about the timeline! The darkest book? Hmm… I would say LB is much darker, but "dark" has never been an adjective that comes to mind when I’ve read SC. Still skeptical. I really hope they do it justice! I guess it technically is the darkest since they’re underground for half of it. The silver chair is… not the darkest of the books by a long shot; it’s the second darkest, fine. But The Last Battle is much worse, it’s filled with death, not just by battle, not just of minor characters, but of a whole world. It’s accompanied by the strong implication–if you follow C.S. Lewis’ deliberate religious themes–that one of the children abandoned her loyalties and is thus damned to hell. Seriously, it’s like a Greek Tragedy; "And then everybody died" could sum up the book, and yes… yes, it’s meant to be a positive thing, I understand that the majority of them go to fantasy heaven even if others appear to be stuck in hell or limbo / purgatory, but… it was still a seriously disturbing read as a child. I just wanted to continue reading about the adventures of kids in a fantasy land. I love the Chronicles of Narnia movies I’ve seen plus I have the other three on DVD and I can’t wait to see this one I must be honest I thought you all had quit releasing any more cause I know there were seven books. Definitely the darkest of the books, remember what was going on at the exact same time as the main plot, the dwarfs who were digging a tunnel to destroy Narnia from the inside. Something just mentioned in the books can be adapted like the elements of the hobbit into a duel story line and make this an epic movie. Once again, how are they planning on marketing the film as a reboot in the middle of a franchise? How are they planning to win over fans of the films primarily who want to return to that specific world? Because I can tell you as a fan of the films, I’m not as interested, because I wanted Narnia 4, not just an adaptation of The Silver Chair. If Fox managed to keep the continuity, then they could figure it out. I have to respectfully disagree with you. I came to the books through the films. While the films hold a special place in my heart, I’m not so attached to them that I would mind subsequent films to break continuity with them. Let’s face it. They weren’t great pieces of Cinema. I sometimes feel that film fans overestimate how much those films resonated with general public. I’m more in love with the books now than I ever could be with the movies. All I’m concerned with now is they make a faithful and respectful adaption of the SC. Johnston did call it "the fourth film in the series" so it appears it will share continuity – not that means much with The Silver Chair. It’s far more risky (financially and creatively) to make a direct sequel to a film from 7+ years ago, that was not well received by audiences, than to ‘reinvigorate’ the film series. Don’t you think Silver Chair needs a distinct tone, style, and feel? The book provides the perfect opportunity to accomplish both sequel and reinvention. And as a fan of these great stories, I don’t like the Narnia 4 idea; it is better as they are now fixed on reinventing the SC. The world of the first three films does really speak the full Narnia sense to me, except for the first one, which it has some fair stuff. The second film was a disappointment thrill – I was not satisfied to the end. And the third one served so little taste of that Narnia experience that it was to me almost an embarrassment to what the artistry of the book can be filmed. I agree. I was first a fan of the movies, then the books. I wish the Silver Chair would capture the magic of the first two movies. The third seemed filmed almost like a TV movie, and the composer was changed so the soundtrack was not as memorable. For that reason, the thing I hope the most about the next movie is that Harry Gregson-Williams writes the score. I know marketing the film as a sequel to an unsuccessful sequel would be suicide. However, what if they marketed it as a return to the magic of the original movies that audiences loved so much? Fox didn’t keep the franchise. The films were not made by Fox. They were made by Walden Media, which did not have its option renewed. This is why there was a seven year delay. In the end, the rights belong to the Estate, which has final say. Here is another interview that not many people watched. In it, Joe says that his plan is for The Silver Chair to be his last film because they are going to start filming a year from now and after that post-production will take another year so it will be 2019. It seems strange to star filming in winter a year from now, because NZ is in summer during our winter. Maybe Joe Johnston is saying they will start filming near July 2018! Would one of the narniweb staff please provide a transcript of the first interview mentioned in this article? My internet stinks so I can’t watch videos. Thanks! I’m not a member of the staff but I can give you a transcript. Joe: The fourth book in the series The Silver Chair, we are rewriting the script and hopefully we’ll shoot in New Zealand, next winter, winter 2018. That’s right, and that means summer in New Zealand (Spring is Sept-Nov, and Summer is Dec-Feb). The most possible release year could be 2019. Since this would be his last film in his directing career, he should make it as splendid as possible…. Silver Chair takes place in the fall / winter. When Joe Johnston says ‘Shoot in New Zealand next winter,’, does he mean winter in New Zealand? It’s summer there now. He said in a different interview that when they start filming in the winter it will be summer in New Zealand. A fresh new story would be great. However, I’d be concerned how Eustace will be portrayed without any sort of reference to his experiences in VDT. The whole point of his getting Jill to accompanying him was because of his previous experiences. And when we discussed SC in the Reading Group, it was clear that his previous experiences in VDT influenced his actions in his second visit to Narnia. There’s no need for any reference of his VDT experience except to mildly state that he’s been in Narnia before, that’s it and stay on the SC. Quite so, except that the very important First Sign that Jill is given in SC depends on Eustace identifying and greeting an old friend. That old friend and how he became Eustace’s friend is in itself a reference to VDT, and the reason why Eustace is in Narnia with Jill. What really is meant by next winter, or even Winter 2018? Is it 1) the Northern Hemisphere Winter, which starts December 2017 and finishes February 2018? Or 2) The Southern Hemisphere Winter when they will be preparing in New Zealand, which starts at the end of May and continues to the beginning of September, 2018? 3) Or is it the next Northern Hemisphere Winter which starts in December 2018 and goes into 2019? My guess is option 2, but others may disagree. If ever there were a time to ‘reboot’ the series, this is the perfect time to do it, even just story-wise. The Pevensie’s time as the primary protagonist’s is done and now Eustace and Jill can step in here and the others in the later books. Assuming all seven (probably eight knowing Hollywood) films get made (hopefully), I’ll likely remember them as Pevensie and post-Pevensie with the change in style to mark it. If ‘The Silver Chair’ starts filming in December, 2018, the film will be complete and released worldwide between March and July of 2020. That’s what I think, after researching the filming start-dates of the previous 3 films. It’s a long way away, but I can’t wait…! Will there be a fifth film? Yes, there is supposed to be a new trilogy with this movie, the Silver Chair, as the first of the trilogy. They have not announced what the other two movies would be, or more specifically, which of the seven books they seem to have choosen not to adapt into a movie. HERE’S what the word "trilogy" most likely means: The Silver Chair, followed by…… THE LAST BATTLE – PART 1 and THE LAST BATTLE – PART 2. Oh! I hope not but that could be I guess! Makes sense in terms of actually having a consistent story. I have appreciated that the previous 3 movies maintained a "PG" rating. What ever their shortcomings, they have been magical for my kids and watching the movies has been something of a tradition and "right of passage" upon meeting the necessary prerequisite: reading the book. It will be sad to me if in attempt to attract a more mature audience the content of SC excludes those for whom the book was written. I hope they keep it "PG"
Can you say me the related date and how i can find the trailer? This should have came earlier. I hope u will considér to keep thé Christian thème, it seems there is à lack of boldness for keeping with truth. I apologize for not elaborating on my first message. I am extremely thankful for your work in this movie. Forgive me for not of mentioning that. God bless You. I am a big fan of Narnia and I have mentioned to those I know to get ready for the upcoming Silver Chair! Tres Bonne! The Horse And His Boy and The Magician’s Nephew. The BBC versions of TCON were enough for me as a kid, but those two books just couldn’t have justice done–ESPECIALLY The Magician’s Nephew–without the technology we have today. I want to see Tashbaan, I want to see Tolkein’s answer to Aladdin meets a boy’s version of a Cinderella rags-to-riches story. I want to see the creation of Narnia, the garden, and, my GOD, I want to see Charn. I want to see the beautiful, frozen world on the verge of ending… the hall of the images of the white queen’s ancestors… I want to see Jadis, frozen in time, at her moment of triumph, yet awaiting rescue. I admit, I did love the Voyage of the Dawntreader, and I was -crushed- that they left out my favorite scene in the whole entire book, but even so, I had a good enough film version of that. These two, though, have never been done and they deserve at least one shot at the silver screen and I gotta be there to see it.